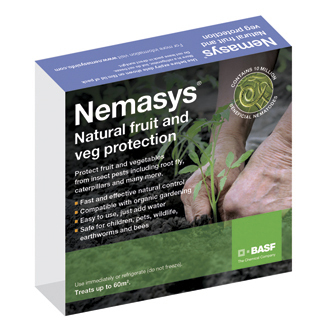 Nemasys® Fruit and Veg Protection 60m² is a natural product containing a blend of different species of microscopic worms (nematodes) that controls many pest insects seen on many vegetables and fruit. -Carrot Root Fly, Cabbage Root Fly, Cutworm and Onion Fly, Ants apply April to July. -Caterpillars and Gooseberry Sawfly, Thrips- apply May to October.